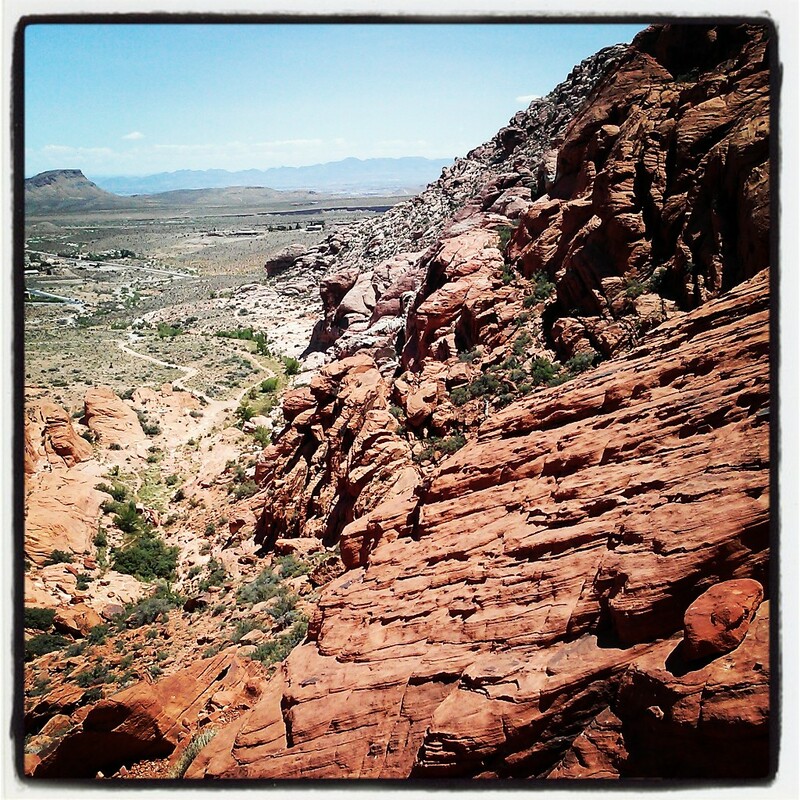 Mr. Enthusiasm suggested we check out an area just outside the Red Rock Canyon state park, an area called Calico Basin. I cautioned that my hiking guidebook didn’t list any trails for that area, so we’d be going in blind. He shrugged and told me to live a little. We parked along the side of the road and made our way towards the Basin. A trailhead appeared not too from the road, so I knew we weren’t too far off a beaten path. This gave me comfort. A pretty clear gravel trail snaked it’s way up towards the mountains. All good. There were even a few signs indicating we were indeed on an actual trail. About a quarter-mile in, we got to a rocky area of flats with no discernible trail. Just rocks. Everywhere. This was taken from above, but you can hopefully get a sense of what I had to deal with to get to “above”. Just mad scrambles over big boulders. And the hopes that I was headed in the right direction and was still on “the trail”. Eventually I clued in to the fact that there was no more trail. That the goal was simply to get to the top of that giant pile of rocks. And to do that I’d have to scramble. A lot. I had that moment of “…do I really want to do this?”, followed by “…Can I do this?”, followed by the inevitable, “I could really get hurt doing this.”. All valid questions and concerns. I don’t ever want to fully quiet (or disrespect) that voice inside my head that serves to sniff out the potential dangers in any given situation. It’s that gut instinct and voice that has kept me safe from some very real threats in the past. But, what I know I must do, to truly grow, is to acknowledge those fears and questions, and then rationally consider the severity of the threat (risk) and the potential for success (reward). Once I can make peace with the risk/reward I can make a healthy and smart decision as to whether I should soldier on or pull the chute, so to speak. Just as I was having this inner dialogue, I looked to my right and saw a guy taking rock climbing lessons from a pro. The student is in white at the bottom of the shot. The instructor is way up there on the rock face, showing him how easy it is. Uh-huh. I actually took this shot on my way back down the mountain. When I first encountered the student, he was about 8-10 ft up, on the ropes, and the instructor was encouraging him. As I scrambled up the rocks, I would look back down periodically to see the student still hovering at that same spot, not very far above the ground; his instructor shouting up words of encouragement. But there he hung, unmoving, for what seemed like forever. He seemed to be paralyzed by fear. A feeling I knew all to well. And I started thinking about the mind’s ability to control us physically. 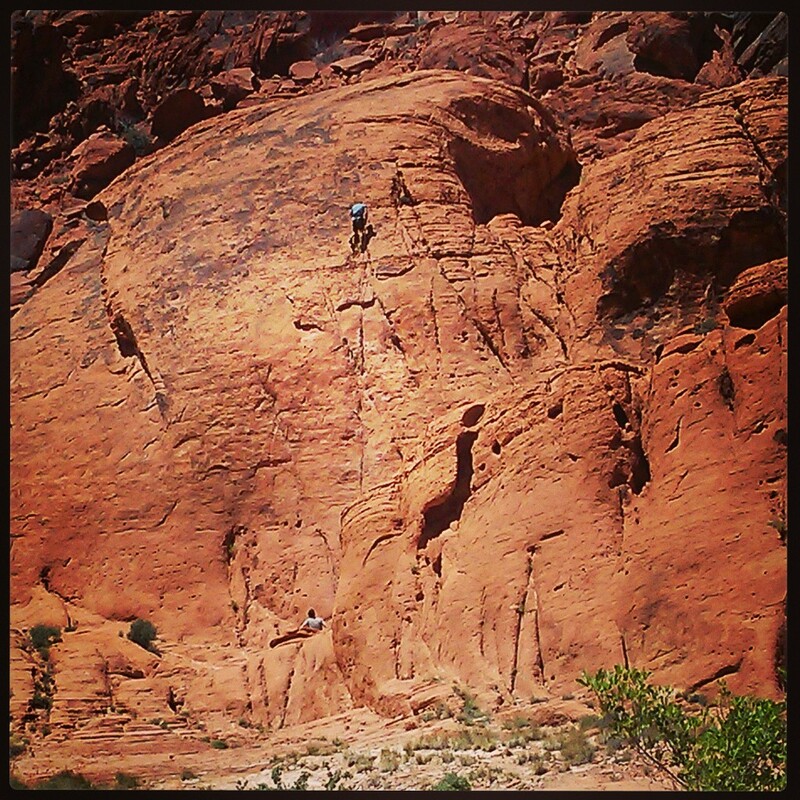 For the rock climbing novice, it had frozen him in that spot so close to the ground. For me it manifested every time I had to climb on unstable terrain. Or more so, whenever I’m climbing back down a mountain. Yes, you read that right. As difficult as climbing up is, in terms of the cardio strain of ascent upwards, for me, the real fear and challenge exists in the descent back down the mountain. I have an unfounded, some could say irrational, fear of falling. It’s just a crazy, stupid, irrational fear. And yet my mind has the ability to freeze my feet to the spot they’re on. Or make me look like a 90-year-old, inching forward as though I’m balancing raw eggs on tiny spoons, while sliding down a sheer icy surface. Ridiculous. Why am I not sure-footed, knowing I have balance, strength and the ability to climb and descend capably? Because I do. And what about my rock-climbing friend? Sure, what he was doing was a LOT harder and significantly more mentally challenging, but at the end of the day was it all that different? He was securely fastened by ropes. He was mere feet off the ground. And yet his mind was preventing him from going up on even one more foot on that rock face. 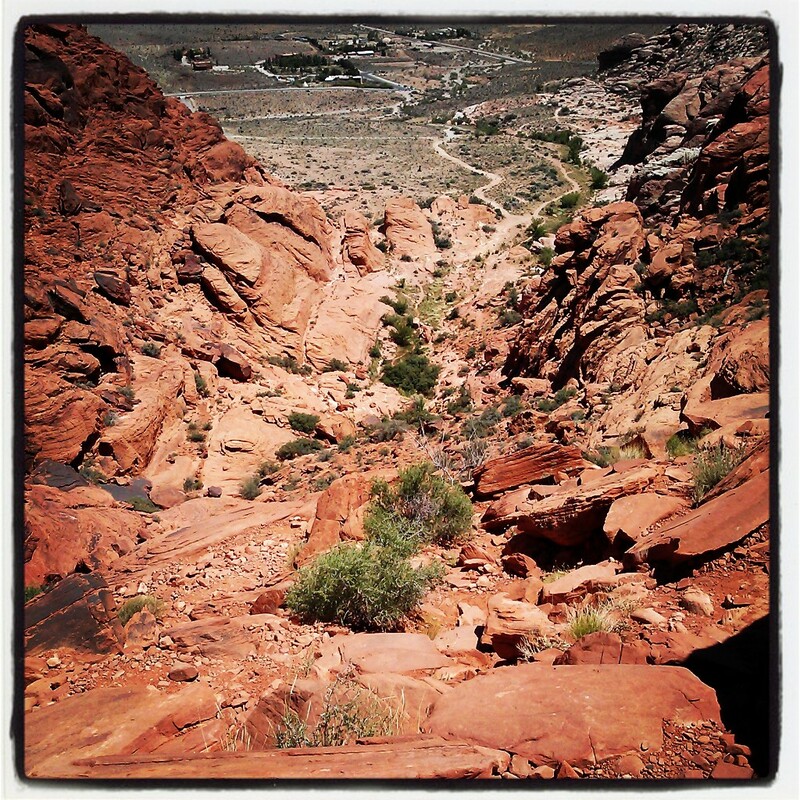 As I made my way to the top of this pile of rocks, and was rewarded with this beautiful view of the famous Vegas Strip, I took a moment to think about risk and reward. But then I was able to take in the magnificence of this planet. I felt strong. Capable. Competent. Happy. Grounded. Centered. And very, very connected to the universe. The reward was worth the risk. It was on the way down that I captured that shot of the climbing guide way up there on that rock face, with the student gazing up at him. And I wished there was some way for me to send him a message telepathically. To tell him it would be okay. To tell him to just believe he was capable of doing it. Willing him to try again, and to go just a few feet higher. I can relate, I responded, I used to freeze with fear over falling 2-3 feet. He nodded in agreement. But look at me now, I continued, I’m building my confidence and pushing myself further each time. It’s not that my body is more capable. It’s that my mind now believes it. Trust me, I know that feeling well. There was that hike in early January of this year that I wrote about, the one where I froze in my tracks on that narrow shelf on the rock face. I seriously thought I would just grow old and die up there because I couldn’t take another step, I was that scared. This is fantastic. I so needed this today. TO be honest…I can completely understand that student’s fear! actually i am slightly lying…it took me no time at all to trust the ropes when I first started…then it took a long time to retrust them. Of course a bad fall/accident will really mess with our heads; how could it not? My fear of falling stems from two falls I’ve taken in my life; one resulted in a broken wrist, the other in a broken tailbone. Neither was much fun – so now I’m always tentative. Like I said in the post, for me the challenge is sorting through which fears are rational (because those protect me from real danger) and which ones are just in my head/irrational – because those just hold me back. Recognizing the difference between the two is not always easy for me. I don’t think it is easy for anyone! my brain seems to manufacture worst case scenarios for everything and feed them to my conscious mind with no discrimination between possible real danger and total irrational craziness! It is finding the way to tell the difference that is definitely the hard part! I know what you mean though, it gives your rational brain some ammunition against the crazy self sabotaging brain! I love that expression – the body achieves what the mind believes. That simple sentences sums up my own inner battle. My coach once said that she wished she could just unplug my head because it was preventing me from achieving … and I knew she was right. The worry-birds never really leave us, do they? With practice and experience, we just might get better at harnessing them for positive results instead of failure … or we stop trying. Thanks for the reminder that I need to work more on my mental game because I think that’s where my breakthrough is going to happen. The worry-birds have never completely left me, although I will admit that they are becoming fewer and fewer 18 months later. As a girlfriend of mine told me, “Nancy, it’s not easy to reprogram those tapes playing in your head. The ones that we’ve been listening to since we were young.” And she’s right. That’s exactly what this feels like for me sometimes; it’s as though I need to un-brainwash myself from previously ingrained beliefs that hold me back so much. It’s a process… but, you’re right, Joanne, that’s where the breakthroughs happen, I think. Coming back down is never as easy as going up. It’s funny, you know, the only time I’ve had to go down first and then climb back up (when I did the grand canyon rim to river last month) it wasn’t as bad going down. Maybe my mind was confused because my ‘climb’ was actually a descent… It was my most assured descent to date. The mind is a curious thing. Yes, the mind is quite perplexing. This is true. My mind tends to be more self-sabotaging than dangerous to others. Then it’s clear we would be no good together on the side of a mountain. TD: I can’t do this either. Hope you’re doing well and keeping cool! Ha ha! What tummy donut?! It’s all I see when I look at that pic. Our own thoughts can be our worst enemy…I know this enemy well. Thanks for this throw back Nancy! It is a good reminder that we can overcome our difficulties. 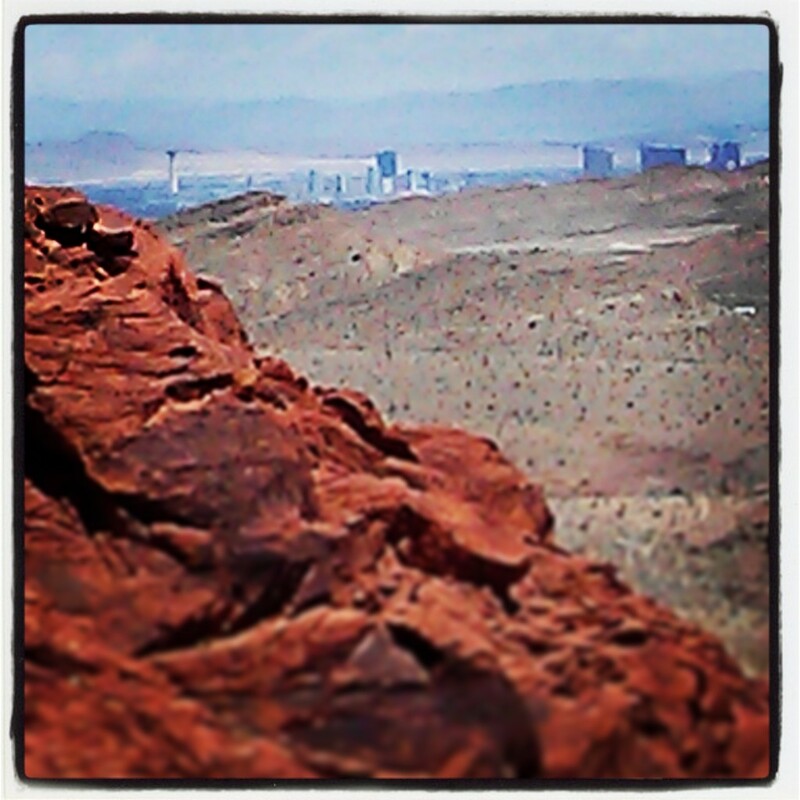 I saw only one problem, “beautiful view of the famous Vegas Strip”. For whatever reason, I just cannot see any beauty in the Las Vegas Strip except in this case where it is far off in the distance. I guess this is a perfect example of “Beauty is in the eye of the beholder”. I find the view beautiful from afar. No different than when I’m on a highway at night approaching the city, there’s something magical about that stretch, all lit up and twinkling. I have an appreciation for nature’s beauty and man-made beauty. I can relate to that. I recently went for a walk with Maggie along the West shore of Alameda. It provided a spectacular view of San Francisco, Treasure Island and the Bay Bridge. Another lovely view, especially lit up at night. This post is so awesome. And familiar. If we don’t put ourselves through anything hard, how will we know what we’re capable of? Amen to that. The few times you shared struggles from the Trace, they resonated so much with me. Ha! I don’t actually do that, it just seems like I am because I’m moving so slowly and tentatively from fear! I know, I was just picturing doing it. After a couple of bottles of wine I may be able to. Please capture that on video! I don’t think a fear of falling is irrational! I’ve experienced that type of fear as well. When you’re utterly immobilized by fear. I have a fear of heights, although I worked for years atop poles with only a leather strap and metal hooks keeping me attached. Amazing that you were able to do that job with the fear of heights. Good for you! Nancy, as much as I loved the adventure story–the keen ability you have of inviting the reader to come alongside you for the tale and experience the physical-ness of the trek–I wholly adore the penultimate sentence. It is worthy of bumper stickers, t-shirts and tattoos. I will remember it always, for I’ve posted it by my computer. Brilliant! Hi Nancy, long time no see…I am back, sort of! 😉 This post resonated with me in an interesting way…it applies to me in certain instances when riding. Specifically, when I encounter a need to move my 600 pound bike in a slow-speed maneuver, such as a tight u-turn. My mind knows that I have the knowledge and skill to do it, but my fear keeps me frozen in time till I use sheer will to power through it. So very strange. I too am working on believing. It’s a process. So good to see you again Lynne! Hope all is well in your world. Yes, it’s good to know others struggle, even when we know better, right? I am working through some stuff. Nothing big, just stuff like this post. I will write again soon, cheers! Looking forward to reading your words!